This year, I volunteered to put together the raffle basket for my son’s class as part of the school’s annual fundraiser. 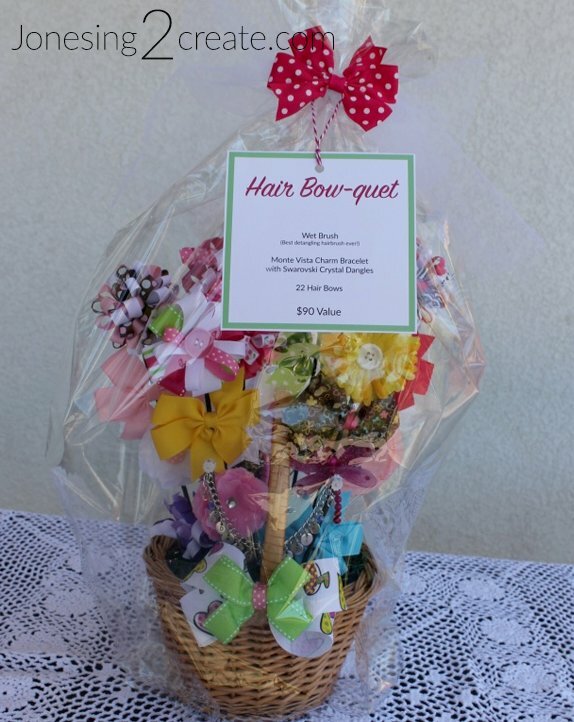 I decided to do a bowquet because hair bows are inexpensive to make, but can cost a lot of money to buy. A lot of the bowquets I found online were going for $50 to $100! I figured it was a good way to pass along as much of the money earned as possible to the school. Plus, my friend Delia and I had a blast crafting together. 1. We started with a simple basket and threw some rocks in the bottom so that it wouldn’t tip over easily. We then stuck in some floral foam and covered it with fake, shredded grass. 2. To make the stems, we wrapped bamboo skewers with floral tape and then stuck them into the foam. I placed four long ones in the back and two short ones in the front. 3. We were able to make several hair bows, but I underestimated how much time they took and so decided to cheat a little. On Amazon, you can buy some very cute bows for very little money. The quality was great and I was so glad I didn’t try to make them all. 4. We then arranged the bows by clipping them on the stems to make it look nice and full. And then we clipped a bow on the front. So easy! I also threw in a Wet Brush, one of the best hairbrushes on the planet. My little girl has really thin hair and it tangles so easily. I have tried detangler without much luck. But the Wet Brush is able to get through her tangles with very few tears or effort. It has been a game changer over here. 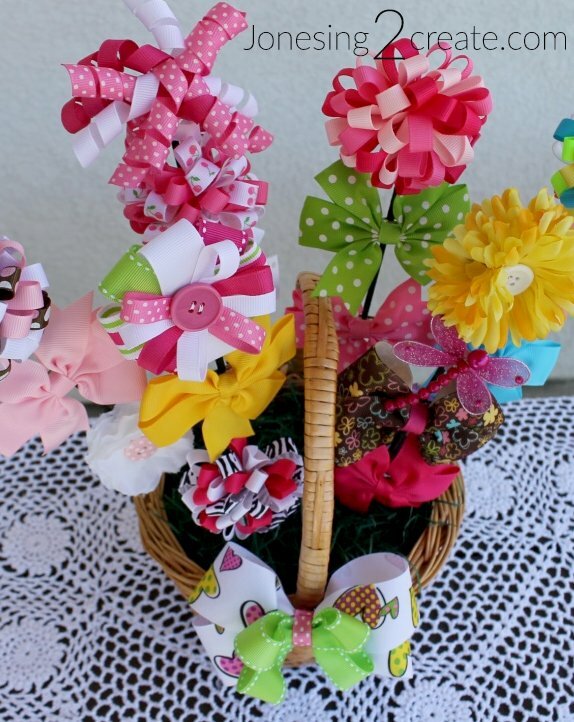 The bowquet turned out so cute, that I am now excited to make a bunch for baby showers. 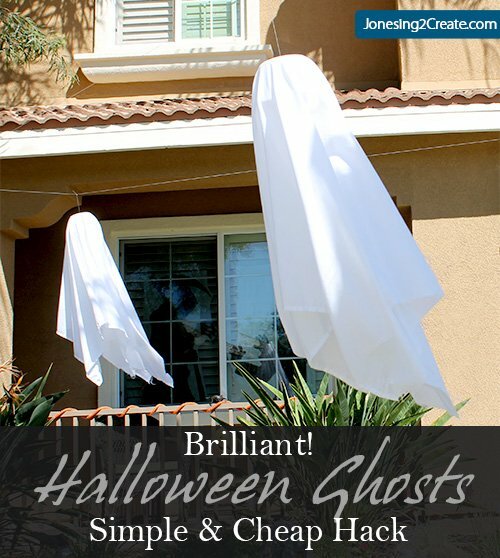 I was able to make it for the fraction of the cost that you can buy them for. 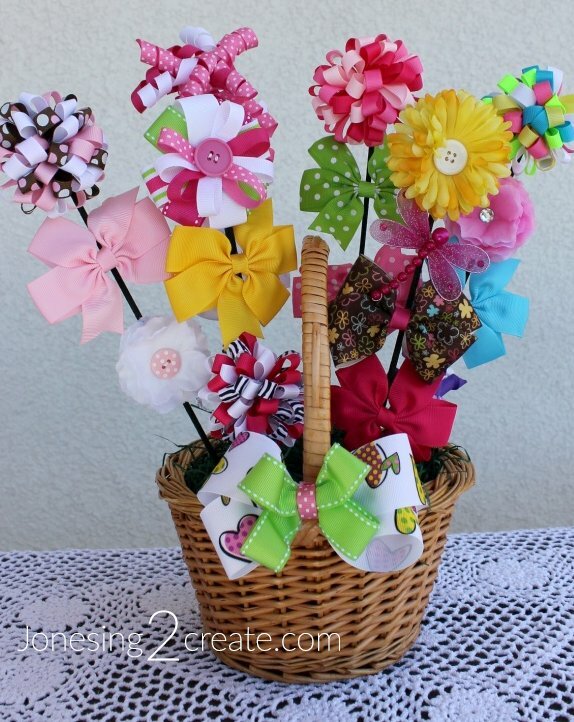 And if you have a little girl, you can never have too many hair bows!